If you choose the Expedited Shipment Option your order will be placed in front of all orders which did not make this request and shipped within 24 hours. The "Expedited Shipment" fee is $15.00. PLEASE NOTE: Depending on your location, it can take from 1 to 7 days for UPS to deliver ground shipments. 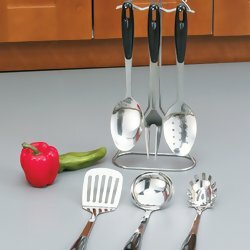 All of our waterless cookware sets are constructed of 304 Surgical Stainless Steel. 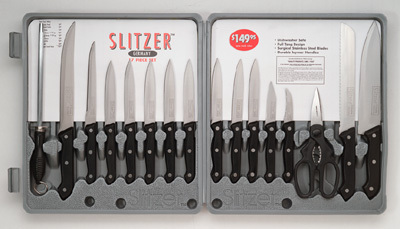 This Chef's Secret set comes with 15 pieces. 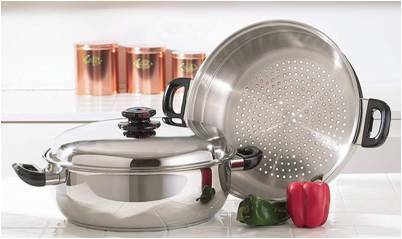 Included is a stainless steamer basket and double boiler/mixing bowl. Lifetime Warranty, Instruction Book and Recipes. Sold here at wholesale. 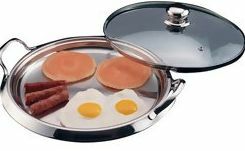 Our 304 Surgical Stainless Steel Waterless and Greaseless Electric Skillets are constructed of 5-plies. This multi-ply construction makes greaseless cooking possible with fast, even heating. 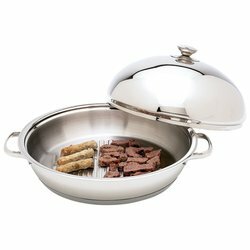 We have two stainless steel electric skillets, one with the oil-core bottom, and the other with a circular electrical-coil bottom. 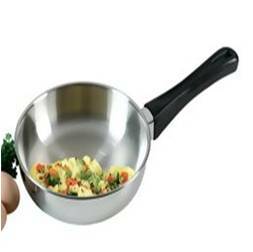 Either skillet will compliment your waterless cookware set perfectly. with a set of cookware. 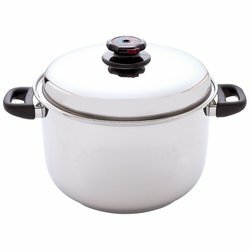 This 304 surgical stainless steel stockpot-cooker is an excellent utensil for pasta, seafood, soups, stews and rice. 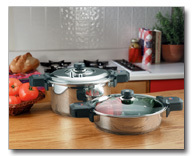 The 9-layer, 8-quart multi-cooker boils, steams, and blanches. Simply lift out the deep pasta insert after the pasta has cooked. There's no need to pour hot water into a separate colander. This way is much easier and less messy, not to mention so much safer. Comes with a Lifetime Warranty. This giant-sized skillet measures 14-inches in diameter and 4 3/8 inches deep. The steamer basket is just under 14 inches in diameter and 4 1/4 inches deep. 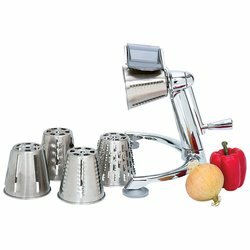 You can easily place the stainless steel steamer inside and steam as many vegetables as you want. But this large steamer pot wasn't meant for use as a vegetable steamer alone. You can use the steamer as a hot dog steamer, a clam steamer, oyster steamer ... or any other type of seafood steamer. 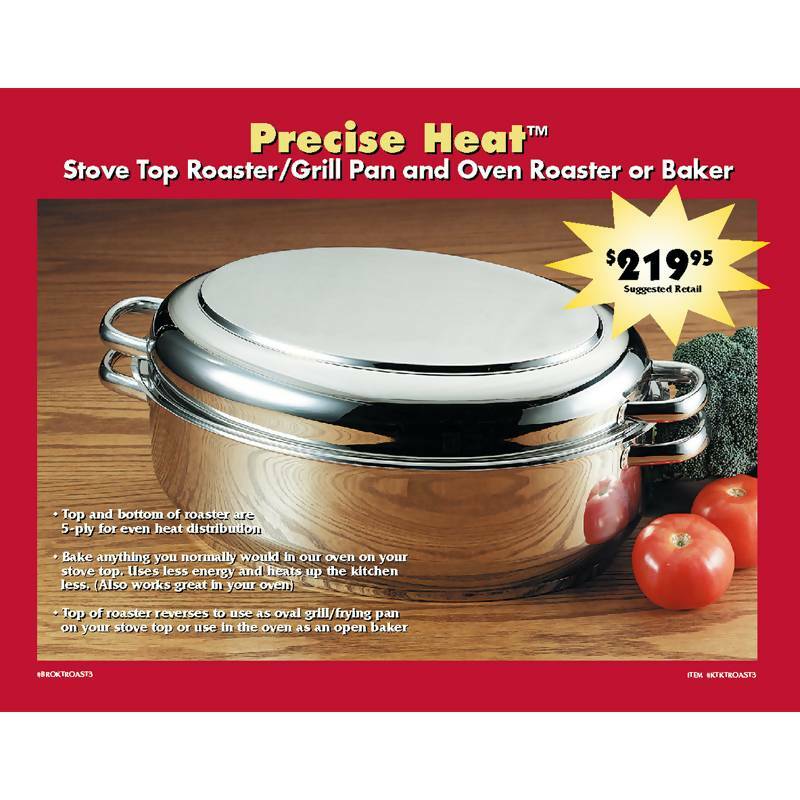 The pot itself can easily be used with the lid as a gumbo or soup cooker.